What’s the difference between hot and cold compost and why does it make a difference? Over the past 5 years at Go Local Food we have been applying as much compost as we can to our fields. This humous has encouraged worms back with the result that the soil and the quantity of vegetables grown have both improved. This year we have produced 5.5 tons of veg (despite the weather!) – an amazing achievement. 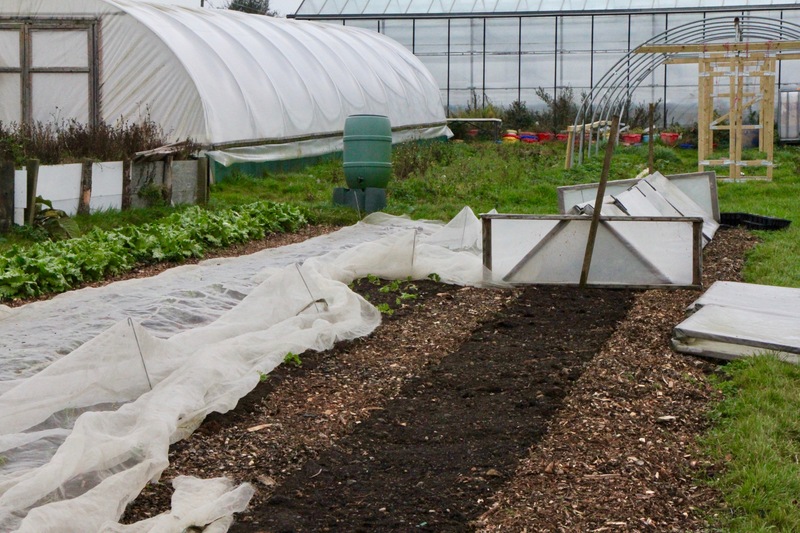 We estimate we use around 30 tons of compost each year over the whole Go Local Food site – a mixture of our own ‘home grown’ compost using waste from the fields mixed with waste from Halls Nursery, and compost which we buy from the Council. The waste that the Council produces has been heated to kill weed seeds and pathogens. The compost we make does not heat up and so is full of seeds and weeds – which means when we spread our ‘cold’ compost we are re-introducing weeds to our beds. A major part of our no-dig project is to produce hot compost. Since we received notification of our grant from the Community Foundation for Tyne & Wear and Northumberland, we have looked more closely at the design of our proposed compost system and are now ready to make a planning application. In the meantime, we continue to grow in our test plots and are gearing up for a change in the weather. You can also see that our next poly tunnel is slowly taking shape.